Mint and chocolate is a great combination in a sweet treat. 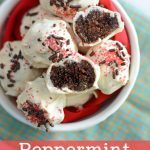 And these easy to make peppermint brownie truffles are a great way to enjoy those two flavors together. 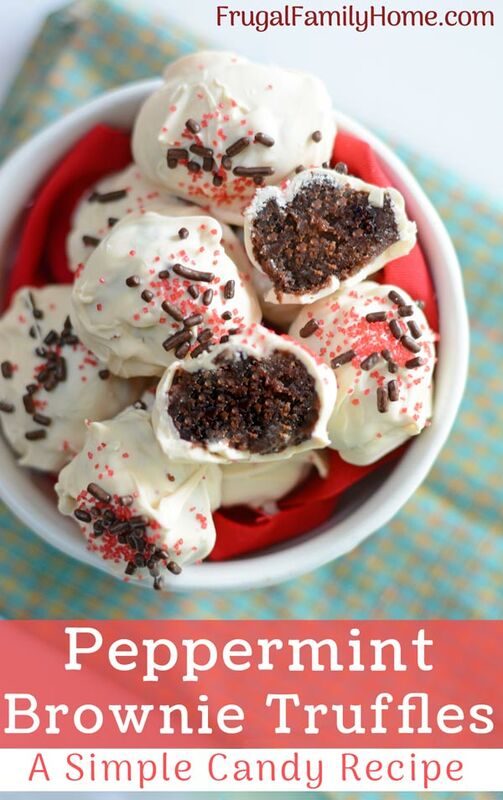 Plus, they are so easy to make if you can make brownies you can make these peppermint brownie truffles. These yummy minty truffles would make a great hostess gift or dessert to take to a holiday party. 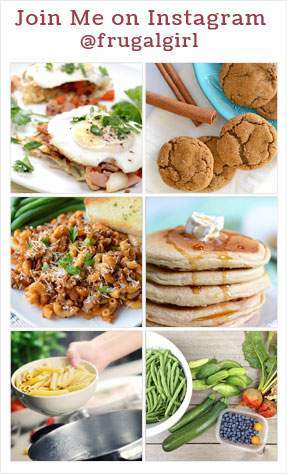 You need not tell anyone how easy they are to make. Enjoy the compliments from everyone who says how great your truffles are. This recipe is close to the brownie truffles recipe. Except in one way, you need to add mint to it. 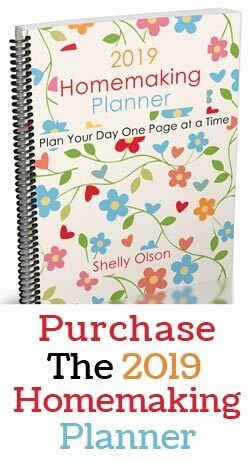 You can start with a homemade brownie recipe and add a few drops of peppermint flavoring when mixing in the wet ingredients. Or you can use a box mix add the peppermint flavoring at the same time you add the other liquid ingredients. Either way, they will turn out great. You’ll need to bake your brownies. Mix the mix or make them from scratch. But when you are adding the wet ingredients, add a little peppermint extract too. If you are using a box mix, follow the directions for fudge like brownies instead of cake like brownies. They will roll together better and be more like a truffle. Once you’ve baked the brownies, let them cool. Cut off the crisp edges, they don’t roll into truffles well. But don’t throw them away, they are great to snack on and my favorite part of a brownie and maybe your favorite part too?! After you roll the brownies into brownie balls, cool them down so they’ll be easier to dip. You can freeze them for about 30 minutes or you can freeze them overnight. Whatever works best for you. Once the brownie balls are nice and cold. It’s time to take them for a dip in yummy white chocolate. Ok, you can use any kind of chocolate you like but the combination of white chocolate on the outside and yummy dark fudge mint brownie truffles on the inside is so good. Melt the almond bark in the microwave at 30-second intervals. Stirring in between each interval until the almond bark is melted and smooth. Roll those fudge mint brownie balls in the melted white chocolate until it fully covers them. Let the excess chocolate drip off and return them to the lined cookie sheet. Add a dash of sprinkles and continue on with the next one until they are all done. Let the chocolate fully harden and then store in an airtight container. See they really are that easy to make. You can grab the printable peppermint brownie truffle recipe below, but first let me share a few tips to help your peppermint brownie truffles turn out great. Fully cool the brownies before rolling them. If they are warm, they might not hold their shape well at all. Cut off the crisp edges, they won’t work well for the truffles. You can add crushed peppermint candy canes or crushed peppermint hard candies to the batter before baking. 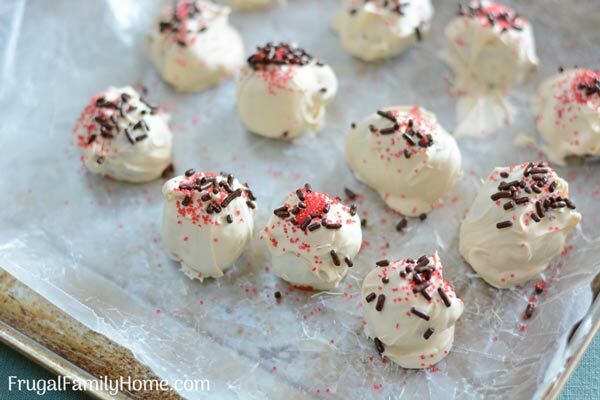 Or roll the brownie truffles balls in crushed peppermint candy before chilling. To add even more peppermint flavor. Or you can stir in the crushed peppermint candy into the white chocolate before coating the brownie truffles. The coating won’t be as smooth but they will taste great. When melting your almond bark don’t overheat it. Be sure to microwave and stir at regular intervals. If the almond bark is overheated, it will get grainy and be ruined. 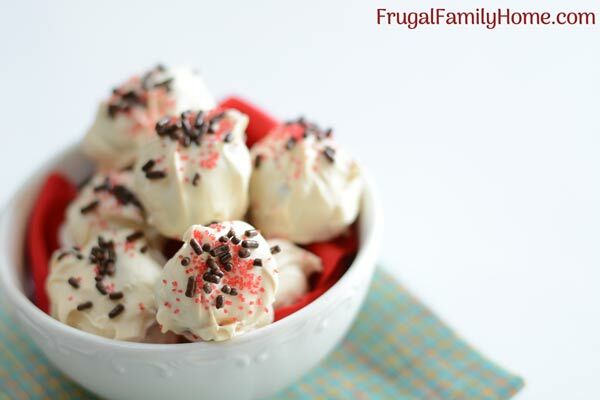 Add the sprinkles to the peppermint brownie truffles right away after dipping. If you wait the chocolate could harden and they won’t stick. Easy to make truffles that are so good, your friends and family will rave about them. Prepare the brownies mixing in the peppermint extract with the other liquid ingredients. After baking the brownies and letting them cool, cut the crispy outer edges off the brownies. Cut the brownies into squares, I like to cut them into 1 1/2 inch squares but if you like bigger truffles cut them bigger. Take each brownie square and roll it into a tight ball and set onto a wax paper lined cookie sheet. Once all the brownies are rolled into balls set them aside. Place the candy coating into a medium sized pan and heat over low heat, while stirring until the candy coating is smooth and melted. Dip each brownie ball into the candy coating and roll to coat well. Place back on the wax paper and sprinkle with the sprinkles if desired. Let set until the candy coating is firm. 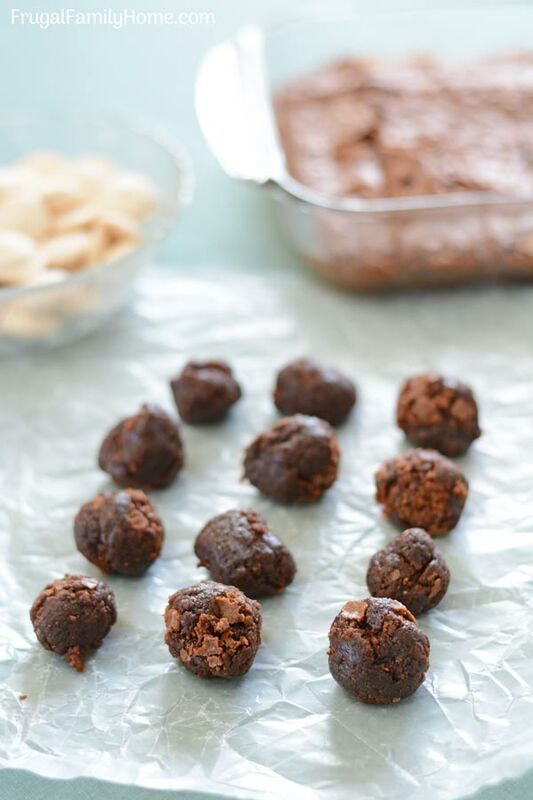 You can dip these brownie truffles in any kind of chocolate you like or in candy coating. The candy coating is easier to work with.